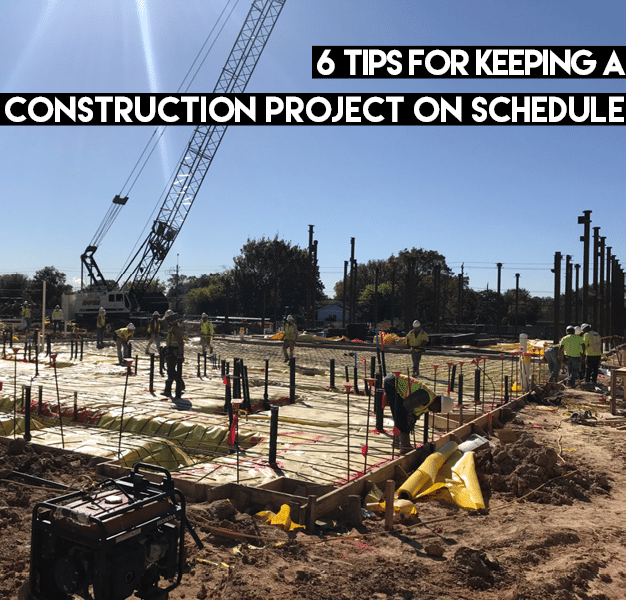 6 Tips for Keeping a Construction Project on Schedule - Rice & Gardner Consultants, Inc.
All too often, contractors end up fighting for a project without completely understanding all the details and exactly how the owner expects it to be carried out. Without taking extra precautions to ensure the project is well-defined, teams sometimes take on more than they intended. For this reason, it’s important as the Owner to have a clearly defined scope of work. It’s crucial to the success of your project because it will be a determining factor in one’s liability to another party. Do not submit a bid unless it is clear exactly what is expected, and when negotiating a contract, make sure the terms of the contract are clear and well-defined in order to avoid being held responsible for something outside the original project plan. An experienced Project Manager can help you throughout the bid and solicitation process with recommendations and evaluations. Utilizing a construction software can help mitigate the risk of disputes or discrepancies in payment for work. Essentially, a good construction software can be used to track and capture everything happening throughout the project, from inception to completion, including project activities, costs, and any/all documentation. Rice & Gardner’s Project Managers are familiar with popular software such as eBuilder, along with many other industry-preferred platforms. Changing your mind about the use of different materials can also have an impact on the timeline. Consider, for example, if you change your mind about the type of roof that you want to install. Some roofing materials require installation on a reinforced structure, so the roof may need to be reinforced before the roofing material can be installed. In some cases, new materials that the client wants to use may be on back order and may delay the project by several weeks. Do your research about building materials now to avoid delays later. Another helpful tip to follow to help you keep your project on track is to review the work of your team periodically with your contractor. The best contractors will have walk-through appointments with their clients at regular intervals throughout the process. For example, it is common to do a walk-through before the drywall is hung, and this is so you can see the position of the HVAC vents, the electrical power outlets, the water faucets and more. If you need more walk-through appointments, talk to your contractor about this. Maintaining open communications with your contractor will ensure things go as smoothly as possible. There may be times when your contractor urgently needs to reach you, and you need to be reachable to avoid delays with the project. Always respond to calls and text messages as quickly as possible. Be aware when your decision-making process is holding up the construction process. Alternately, an experienced project manager can handle these types of day-to-day communications to keep things running smoothly. Incompetent management of budget and schedule is a major reason for project failure. Project Managers are responsible for creating a project plan that includes all the required elements and delivering the completed project by the deadline. A Project Manager is there to assign roles and responsibilities within a project and to coordinate labor and materials to the job site so work can get done in a timely fashion. A great Project Manager can juggle several aspects of a detailed project plan while working to minimize delays and aggressively remove blockers that can hold up progress. Contact Rice & Gardner today to find out how one of our qualified Program or Project Managers can make your next project a success!